What’s the difference between an H-bomb and an A-bomb? The hydrogen bomb (H-bomb) is actually significantly more destructive than even an A-bomb. While A-bombs release energy via chain fission reactions (breaking apart heavy nuclei), H-bombs release energy through fusion of light nuclei. This energy comes from an overall increase in stability due to the strong force that holds nuclei together as the light nuclei fuse to create heavier ones. To give an idea of the relative powers of these two weapons of mass destruction, consider that the A-bomb dropped on Hiroshima had a force on the order of 10 kilotons (explosive force equivalent to 10,000 tons of TNT), while a common H-bomb has a force on the order of 10 megatons, or 1,000 times the explosive force of the A-bomb used at Hiroshima. 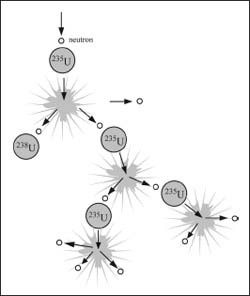 Uranium-235 chain reactions start because the radioactive substance naturally emits neutrons that then collide with other atoms. In a nuclear bomb, the goal is to let the reaction reach a critical point where there is an explosion, but with a nuclear reactor the tricky part is controlling the reaction.